Stubbs the Cat campaignStubbs the Cat’s campaign has promotional material. Stubbs the Cat, the honorary mayor of a small Alaskan city, apparently wants to shake up the state’s highly competitive Senate race. In an Election Day press release “announcing” the last-minute campaign, people purporting to represent the cat urged Alaskans to write in Stubbs’ name as a protest vote against the mainstream candidates. “When asked if this was just a hairball idea or if he was truly serious, Stubbs replied, ‘I don’t believe my personal hygiene is any of your business,'” the press release said. Stubbs is actually said to be mayor of Talkeetna, Alaska, which has a population of less than 1,000. Last year Stubbs drew national headlines when he was mauled by a dog. The press release touting his candidacy on Tuesday referenced this attack in order to stress the cat’s ability to relate to everyday Alaskans. “And Stubbs stands up for the issues that matter: As the survivor of a brutal assault, Stubbs knows what it’s like to fear for his life. So Stubbs is a staunch advocate of Alaskans’ Second Amendment rights,” the statement said. However, it appears unlikely Stubbs is personally invested in the electoral effort. His Facebook page makes no mention of the political campaign and a worker at the Nagley’s General Store, which Talkeetna’s mayor calls home, told Business Insider she wasn’t aware Stubbs decided to mount a Senate campaign. “I haven’t heard anything about that, so I imagine it’s probably people doing their own thing,” she said. 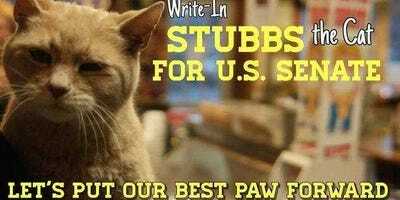 The “Stubbs for US Senate” campaign did not immediately return a request for comment asking whether it was actually associated with the cat. Begich and Sullivan are locked in one of the most contentious Senate races in the country. According to City-Data.com, Talkeetna is a Republican stronghold, with Sen. John McCain taking about 75% of the vote in the 2008 presidential election.